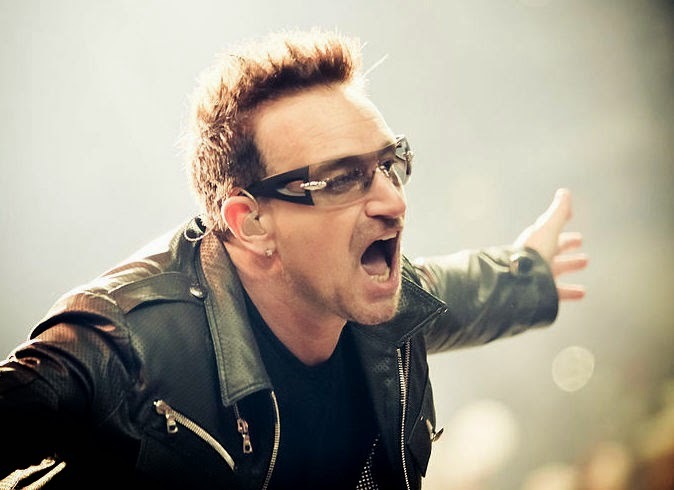 U2 lead singer Bono is not exactly famous for his guitar playing, and most of the band would rather things stayed that way. At the same time U2 certainly can't stop Bono's son from plugging in his own guitar and rocking out. According to Bono, his boy is a fantastic guitar player and a huge fan of Nirvana and Oasis. His son is also "down with" the rock songs on the new U2 Songs of Innocence album. Bono went into some detail on the process of writing those songs while making an appearance on TV's Sheila and Marconi show, talking about how he tried to go back to his emotional roots while writing. Occasionally got quite nervous, such as while writing 'Iris' -- the song goes into his memories of his own mother and the heartbreak surrounding her death. "I had a few nervous moments," Bono admitted. A few days before they released the song, Bono woke up thinking to himself that that sort of song was not a "punk rock thing to do." Then Bono realised John Lennon had written about his mother, so he could do it too. In fact he felt he had to do it. The rage which propels his music, which got him interested in the whole punk rock genre, all came from grief and death and things like that. In the interview Bono also looked at a particularly painful chapter of U2s history, which had occurred in the show hosts' city of Portland, Oregon in the US. Early in the group's career Bono had lost a collection of band lyrics. It happened during the period when they were still figuring out "how to be a band," as Bono put it, and he lost a case full of lyrics. It was kind of a difficult memory for him but it was recently put right -- someone discovered the case, and rather than put the stuff out on the Internet or sell it off, they turned out to be decent people who decided not to make a buck off it when they could have. So what for Bono was a bad memory turned out to be a very beautiful one. Asked about the lyrics themselves, Bono explained that having gotten them back, he doesn't foresee being able to use them in a future release. They weren't all that good, he said, "that was the humbling bit." Asked about the fans who were complaining that they wanted to delete the copies of "Songs of Innocence" that had been automatically downloaded to their iTunes accounts after the band gave away the album to all the people on iTunes, Bono replied that the band doesn't have a problem with that. The band has deleted more U2 music in the last five years than anyone else, he said. "That's why [the new album] took five years."